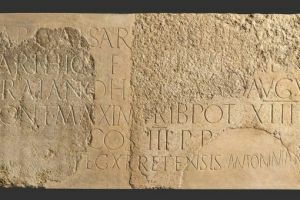 It’s been a few days since part of the famous inscription of Adriano is back in the Studium Biblicum Franciscanum, this inscription is dedicated to the roman emperor by the Tenth legion of the Strait during his journey in Jerusalem in 129/130 d.C. 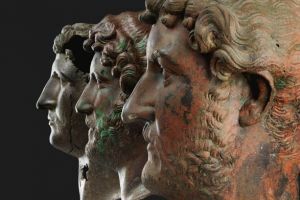 It was in fact exceptionally granted to the Israel Museum, so that it could be shown with the most famous bronze busts coming from the Louvre and the British Museum for the exhibition: Hadrian: An Emperor Cast, in Bronze. 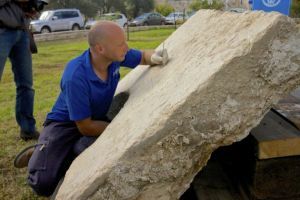 For the first the inscription, founded mutilated in 1903 by Damascus Gate, was exposed together with his complementary part, and brought to light in Jerusalem in 2014 during the excavations conducted in the city by the Israel Antiquites Authority. This second slab was discovered in a byzantine tank in a construction site on Nablus road and it was reused as keystone for the tank, as we can see from the round cut that it shows. The commemorative epigraph probably it was part of a monumental buiding erected for the historical visit of the Emperor in Judea, as it’s testified by the special coins made for that event. 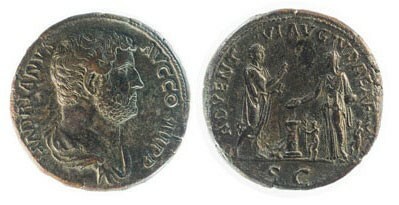 It represents one of the most important Latin translation ever discovered in Jerusalem, because it clarifies the date of the emperor’s visit in the “Holy Land” and underlines the extremely importance of emperor Adriano for Jerusalem. He, in fact, not only put hardly down the second Jewish revolt leaded by Bar Kokhba , but he reconstructed the city as a roman colony, with the shape of a roman colony, in fact the topographic asset is still today recognizable. Adriano also gave the city a new name which will last for centuries: Aelia Capitolina. Today it’s already possible to see part of the big slab in the “Via Dolorosa” multimedia section of the Terra Sancta Museum at the Flagellation Convent, we look forward to see both the fragments together in one of the two Jerusalem Museums.